heavy (double) cream	1 tbsp. This quick and easy asparagus tart makes a perfect side dish for salmon or chicken, or as a vegetarian lunch dish. 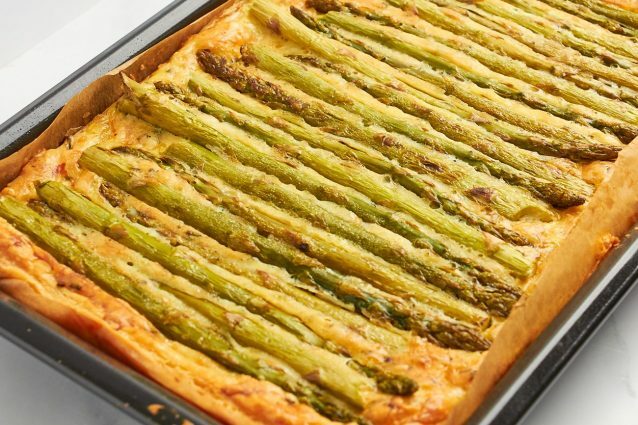 Fresh asparagus is teamed with chives, two kinds of Italian cheese, and cooked on a sheet of ready-made puff pastry. Even beginner cooks can whip this tart up in 15 minutes, then relax while it bakes in the oven. Preheat oven to 400 F/180 C fan/gas mark 6, and line a baking tray with parchment paper. Roll out pastry directly on to the pan if you are using ready-rolled puff pastry, or roll out the puff pastry block on a lightly floured surface to make a rectangle that will fit your baking tray. Using a sharp paring knife, gently score a 3/4″ border round the edges, carefully cutting halfway through pastry. Using a fork, gently prick center area all over, every 1 inch, then brush the border only with egg wash and put in the oven to bake for 10 minutes. Transfer to cooling rack and let cool slightly. If your asparagus spears are quite thick, give them a quick sauté in a little olive oil for a few minutes, then let cool slightly. This will help them to cook properly through in the oven. If you have very thin asparagus tips, you don’t need to sauté them first. Meanwhile, in a medium mixing bowl combine Parmesan, fontina, chives, eggs, heavy cream, and pepper. Spread cheese mixture evenly across center of puff pastry, leaving the 3/4″ border clear. Evenly arrange asparagus across center of pastry, alternating direction and avoiding the border. 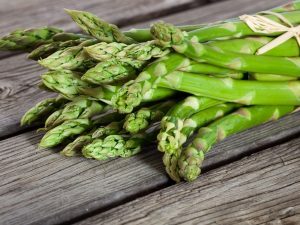 Lightly drizzle asparagus with olive oil (if you have already sautéed the asparagus in oil, there’s no need to add more), and bake until pastry is golden brown and asparagus is fork tender, around 25 minutes. Sprinkle with salt, cut into squares, and serve immediately. * Most supermarkets have ready-rolled pastry in sheets in the refrigerated section of the store, so you don’t have to wait for a block to defrost. * Fontina is an Italian cheese, but if you can’t get hold of any, try using gouda instead. 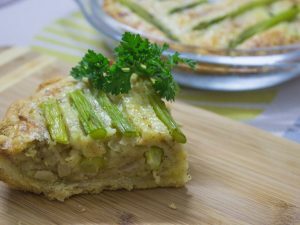 Asparagus swiss quiche: a rich preparation with a wonderful crust and amazing flavors!